Home	/ Story of SVYM / (61) Rendezvous with the elephants! (61) Rendezvous with the elephants! I was traveling towards Hosahalli and was reminiscing the wonderful times I had with some extraordinary people there…and animals too! As I was journeying into the past, I was feeling uncomfortable that I had not seen an elephant for many years now. How strange! A decade ago, I would always wish that no elephant crossed my path! Having lived on the fringes of the forest, I am now a mute spectator to the shrinking tree cover, increasing human population and the steadily decreasing visibility of wild animals. 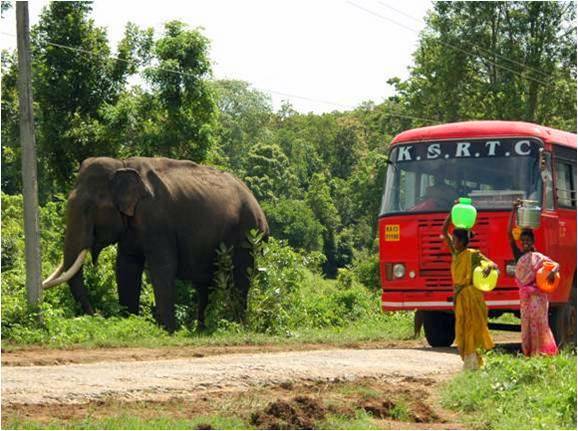 Gone are the days when elephants would visit our Kenchanahalli campus nearly every day. I still remember the days when we had grown Ragi (a kind of millet) at Hosahalli and had built a tree house to serve as a watch-tower. Vivek was an intern then and had gone over to Hosahalli to be the watchman for the day. Around midnight, some tribals informed me at Brahmagiri that elephants had raided our crop and we drove down to drive them away. I was worried that Vivek was alone and would need our assistance. On reaching Hosahalli, I found Vivek standing on a ledge and keenly watching the elephants and doing nothing to drive them away. Angry that he was unconcerned about the loss of the crop, I asked him what he was doing. He calmly told me that we would never get to see such a sight in our lives again and told me to savour every moment that was in front of us. The elephants, in a very nonchalant way, went about pulling the ragi plants with their trunk, beating them against their legs to remove the sticking soil and then devouring them with relish. It was indeed a sight to be enjoyed! We stood watching them for hours till they finished whetting their appetite and returned to the forests. Nothing remained of our crop after that night and we stopped watching over them from then on. Many friends who visit Kenchanahalli have asked me what the small water tank near the residential campus signifies. This was the water tank we had built to store water during the construction of the hospital. It was also the time when we never really had a proper place to stay. A hume pipe that was to be used in building a culvert at the entrance of the hospital was our abode. This pipe served as an office during the day and my rest house during the night. A herd of elephants had made this water tank their favourite water hole. They would visit each night and drink their fill. It had become such a ritual that we would always remember to keep the tank filled before 10 pm every day. I had learnt earlier from the forest department that our hospital was being built on the path these elephants used to walk each day from the forests to the river on the other side. Getting water more easily now meant that they did not need to walk the extra mile. In our own way, we seemed to have developed an understanding: they would not do anything other than just drink water and we too stopped bothering about them. In a sense, we learnt to co-exist. The closest and most fearful experience I had was in early 1988. Ramesh and I were returning to Brahmagiri after attending a house call. Both of us were keenly discussing public health issues and maternal mortality and we were quite absorbed in our own arguments. We were close to Brahmagiri and were crossing a small culvert on the road. Tribals had warned us many times that this was a favourite crossing place for the elephants and had asked us to watch out when we drove around. We were on a Kawasaki Bajaj motorcycle and I was driving, with Ramesh animatedly arguing with some of my radical ideas. As we were just over the bridge, Ramesh noticed a huge adult elephant standing exactly in the middle of the road. As he screamed, I responded reflexively and came down to a lower gear that got the motorcycle to do a wheelie. I wasn’t sure if Ramesh was still seated behind me and did not have the time or the courage to look around. As I drove by, narrowly missing the tusks of the giant, I found my whole body shivering with fright. After traversing a few hundred meters, I quietly put my hand behind and tried to feel Ramesh. He could not speak and his teeth were chattering. Once the dust and heat had settled, I asked him what he would have done if he had actually fallen off the bike. In his own characteristic way, Ramesh said that he would have run and sat inside the hume pipe and was confident that the elephant was too huge to consider coming inside! Looking back now, I can only enjoy the nostalgia and the romance of these events. We were young and adventurous and never really understood the dangers and difficulties that were ahead of us. And if we had done so, I am not so sure that we would have ended up doing what we did later. Fear is indeed a great dampener!